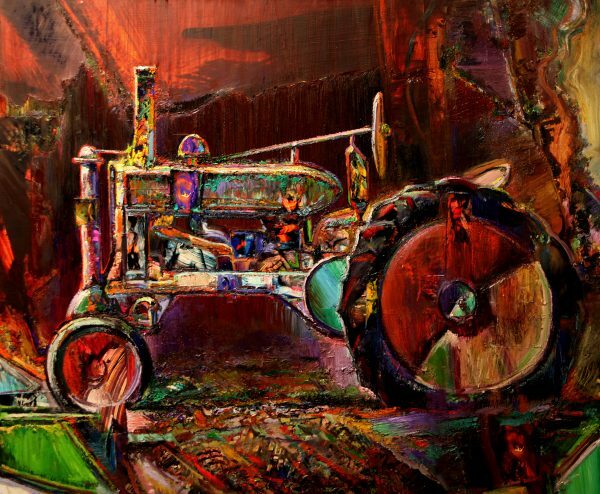 Contemporary visual artist Jeff Myers creates bold vibrant works, mixing oil and acrylic paints with digital photographs projected onto naked bodies and discarded farm tractors. 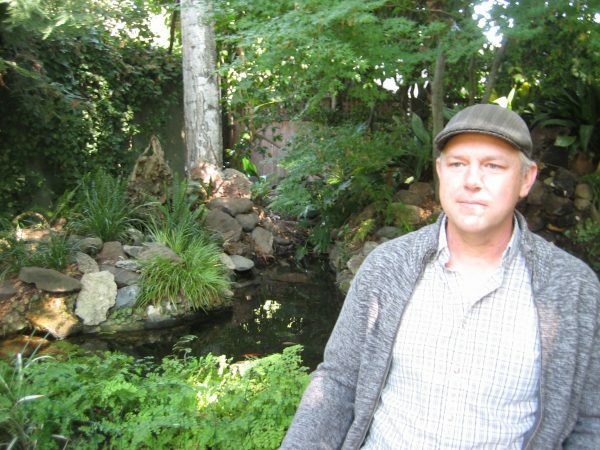 The striking, colorful, and daring art Myers produces, is in contrast to his Zen-like backyard retreat. Here is where Myers built his own version of the rain forest. This oasis is filled with giant ferns surrounding a stone-edged koi pond, trickling beneath a shaded canopy of trees. A small Buddha statue is nestled into the plants with vines growing over and around it. This cool, quiet den seems to mirror Myers own unique personality. Jeff Myers in his own rain forest. 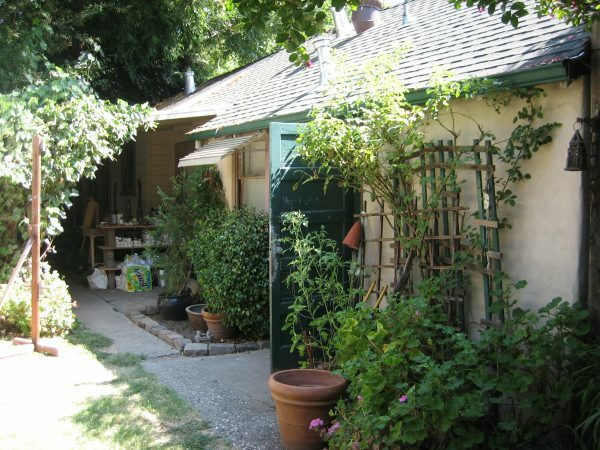 Adjacent to this peaceful garden is Myers’ art studio, comprised of several outbuildings dating from the 1940s, all located in the rear of his Sacramento home. Said Myers, “I like working in a place that’s older than me.” Here is where the accomplished painter and photographer creates richly colored canvases that are exhibited and collected by people around the world. Not bad for an artist who, as a child, suffered the indignities of dyslexia. Jeff Myers studio, as seen from the exterior. 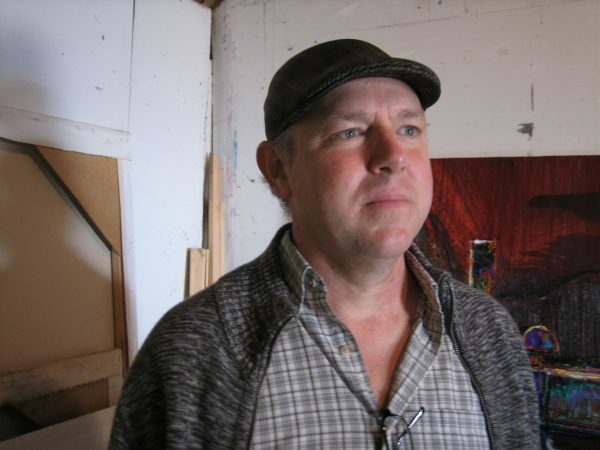 Myers, whose body of work encompasses abstraction and realism, describes his art as, “A wide field of cross pollination.” Some of his large scale paintings were influenced by Italian Futurism and the Mexican Muralists. Exploring, “the back story,” in “The Undercurrent Project,” Myers depicts New Yorkers at work in the media and fashion industries. In The “Droid” series Myers explores consciousness. A recurring theme of agricultural and urban metaphors can be seen in “The Land Series.” A Sacramento native, Myers continues to be influenced by the great redwood forests he frequently visits in northern California. Myers candidly discussed this and much more in a recent interview conducted in his backyard retreat. Artist Jeff Myers in his Sacramento, CA studio, August, 2016. LS: What medium do you work in and what materials do you use? 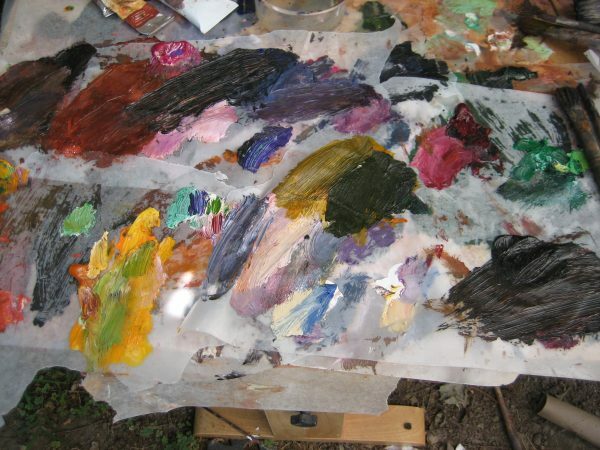 JM: My first love was always oil paint. Although I grew up in a photographer’s family — my parents were both professional photographers — painting has always been my first love. But in the last ten years or so, I’ve been working on a series called “The Body Environment,” which is just photography (digital). I’ve always wanted to see if I could have the painting experience through the experience of photography. And this is the closest I’ve ever gotten to it personally. It’s a complex process. (Note: An accomplished photographer, Myers’ work has appeared in numerous publications including National Geographic). LS: Can you explain the process? JM: I love human patterns viewed from the air, and our affects on the earth, and how they manifest visually and culturally. So, I go up in helicopters and airplanes and I take photographs looking down on city grids, or rail yards, transportation networks, open pit mines, recycling plants. Anything you can imagine. When I’m up in the air, I continually shoot and then edit later. That’s only the first stage. That’s the raw visual clay. Then I take a live model and have them sit in a chair, or on a couch, and ask them to remain very still. The room is pitch black. I use five different projectors to overlay and project these aerial patterns onto the person. The flesh becomes the screen. JM: Yes, exactly. I want as much flesh as possible. The flesh tone adds a very interesting element because it bends spaces and form. And I have no idea what I’m going to get. It’s this visual silo where it’s very rich and has lots of potential. I take a long exposure (Like a section of the Chrysler Building or maybe a Bauhaus style skyscraper.) and put it into the computer. Through Photoshop, I over-sharpen it on purpose to make the form on the flesh have some textural validity to it. It has a pitted, undulated and warped form. And it’s wonderful. To me, it’s a kind of compression of consciousness on the human form itself. LS: How are you currently working with this process? 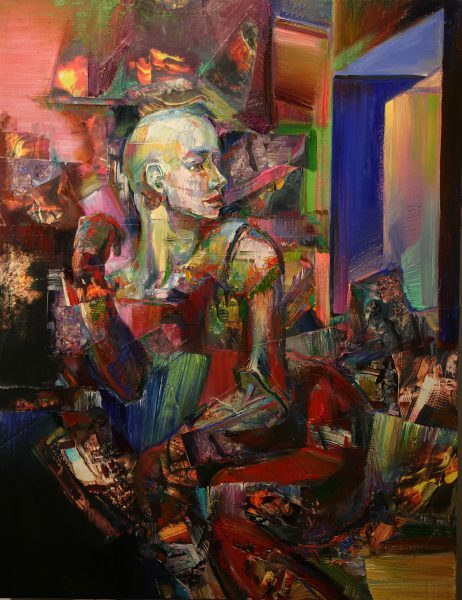 JM: Recently, I’ve been using smaller fragments of the “Body Environment” series in a collage with paint. So I’m welding the two together to see how that works. I’ll use a layer of collage from the series that mimics different pre-determined curves of the form that I’m going to paint. For instance, a person’s back becomes the turn of the top part of a tractor. Then there will be an acrylic layer and oil on top of that. So now it’s mixed media and it’s been yielding some interesting results. I like working on a broad creative front. I get bored very easily. LS: Do you dabble in any other mediums? JM: I love drawing. That’s really the base for all of it. I draw every day, all the time: big graphite drawings, more serious charcoal drawings, bringing in wax and anything else that will create a mark. I keep sketchbooks with me all the time because I like to draw and I find it calming. 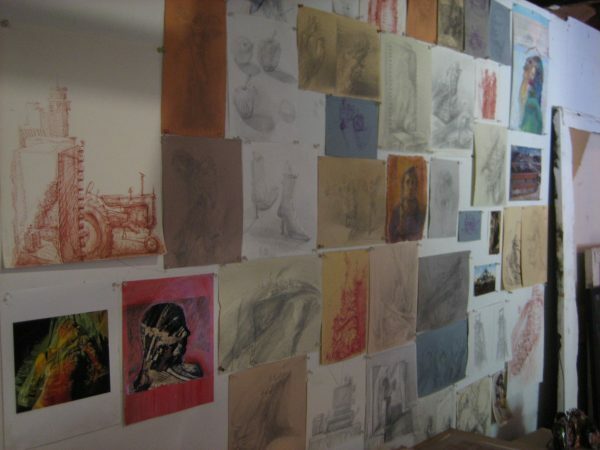 A wall of Jeff Myers’ studio is line with his drawings. LS: Do you have a subject in mind when you begin your work? JM: Yes, I usually have some rough idea what I’m going to paint but then it will change: Tractors into Droids, Droids into a figure, and a figure into something completely abstract. I like taking mundane objects and isolating them like the tractor image. A few years back I was living in New York and working on a big project — the “Undercurrent Project” — featuring people in the fashion and art world. 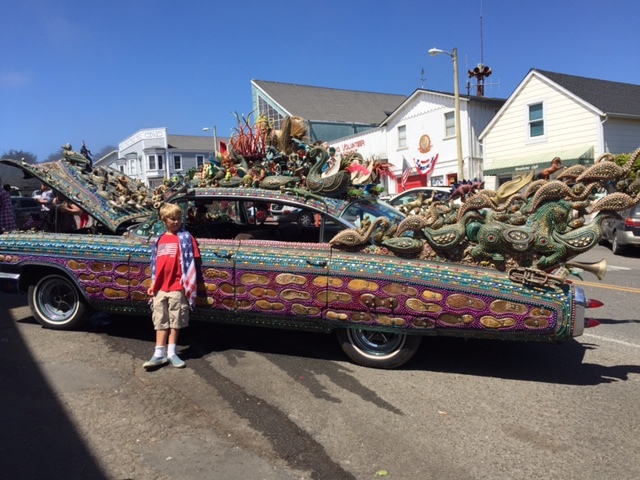 During that time, I would visit my family in California for a few weeks every summer. In an attempt to work on something completely opposite of the “Undercurrent Project,” I would take small canvases out to the Delta and paint abstract landscapes. Then the tractors came to the forefront. And now, the tractors aren’t really tractors; they are just something called tractors. All of the objects I paint now are reimagined. To me they are alive, along with the droids from the “Droids” painting series. I see the tractors as the grandfathers of the droids. They are the descendents of technology and artificial intelligence. “Droid Interior,” by Jeff Myers, Grahite, Acrylic, C-Print Type Paper, 52″ x 40″, 2016. LS: Does your work have a message? JM: Not really. Hopefully when you are standing in front of a piece, it activates your full consciousness. Not just your intellectual side, not just your soulful side, but also all of the layers in between. I don’t necessarily have a big political message but rather, an exploration of consciousness. 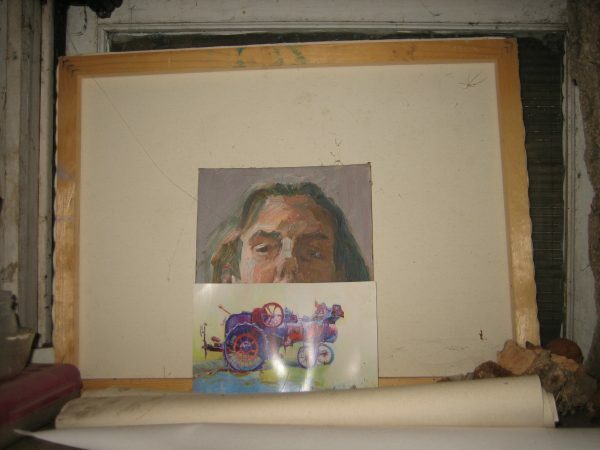 Perched on a shelf in Jeff Myers’ studio is a self portrait, painted several years ago, with a small tractor painting resting in front. LS: Does living in Sacramento have an impact on your work? JM: Yes. I think the number one greatest thing about Sacramento from a serious artist’s point of view is its spaciousness: cerebral spaciousness, its creative spaciousness. The landscape of California and the west is the reason I moved back to Sacramento (After living in New York City for six years. ), which is ideally situated to venture out into the wilderness. LS: Can you name a few of your favorite artists? JM: I like Julie Heffernan. She had an amazing show at the Crocker a couple of years ago. And then there is sculptor Nancy Rubins. Her work is a lot different than mine but I really like her work. And then of course, I have a ton of historical references that I love. I grew up enjoying the British School: Frank Auerbach, Francis Bacon. And, I love Rembrandt, Van Gough, Caravaggio, and Bernini. I always loved African and Oceanic work. I really enjoy the full spectrum. LS: Who or what were your early influences? JM: My dad, Tom Myers, was the most impactful human being in my life. He passed away in 2014 at the age of 88. He was a professional photographer and I would go on shoots with him. We’d be taking photographs of redwood trees up in the northwest for Ranger Rick or National Geographic. And the next day we’d be photographing a protest at the state capital, and the next day a cotton gin outside of Fresno. He created a visual archive of the west that became a photo file of 700,000 mostly color slides of nature, ecology, politics, social events — everything you can imagine. He had a great sense of humor and he loved people. Untitled by Jeff Myers: Oil, Acrylic, Graphite on Paper, 15″ x 11″, 2014. “I consider this a type of visual fragment that I like to have laying around the studio,” explained Myers. LS: Is your mother Sally also a photographer? JM: Yes, they both built the archive together. LS: Is your wife an artist? JM: No, my wife, Sonja Jimenez, is an acupuncturist, healer and shaman. She challenges me in ways, and is a tremendous supporter, both intellectually and emotionally. LS: Can you talk a little bit about growing up dyslexic and how if affected your education? JM: Well, that is just something you are born with. I didn’t know I had it, I was clueless. All I knew was that everyone else was learning to read much faster than I was. I could vocalize well but I didn’t know what was going on with the reading. School was not my favorite activity. I left high school as fast as I could. In fact, I walked out in my sophomore year and walked down the street and started sitting in on art classes at Sac City College. 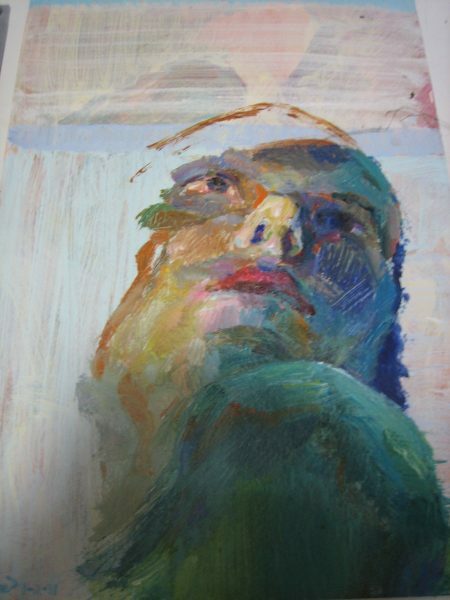 Then I met Wayne Thiebaud and went to UC Davis and then Sac State. I was going to all three colleges at once. LS: Who were some of your instructors? JM: My primary teachers were Darrell Forney and Fred Dalkey at Sacramento City College, Oliver Jackson at Sac State, and Wayne Thiebaud, Manuel Neari, Robert Arneson, and Roland Peterson at UC Davis. Because of my dyslexia I really chose my own route for education. I had such a bad taste in my mouth from elementary and high school that I chose art related classes. I’ve gotten flack for it but I don’t care. It made sense to me in my life. Of course, New York was the final piece. Living in New York and going to the Met and MOMA. LS: Is there anything else that influences your work today? JM: Digital photography. Also, the exploration of human consciousness. Questions such as: What is consciousness? What are the boundaries of consciousness? Are there boundaries? How does the Western cannon look at consciousness compared to the Eastern way? LS: Are you a practicing Buddhist? JM: No. But I like studying their philosophy and I meditate. I have friends who are Zen masters. I like their technology of mind. LS: Do you have any work currently on public view, or anything coming up? 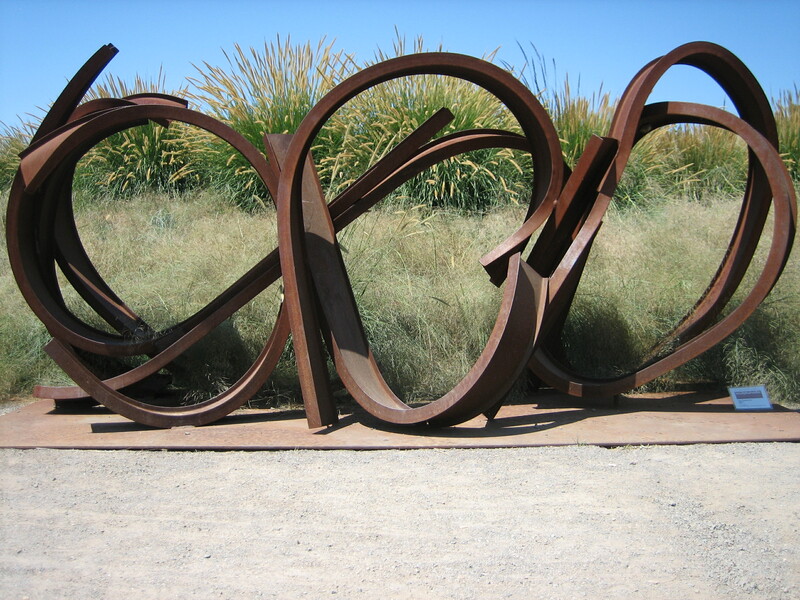 JM: Right now I have an exhibition at the California Agricultural Museum in Woodland, CA. I also have a one person show lined up with the Elliott Fouts Gallery in Sacramento scheduled for November 2017. That show will focus on what I call the combines or combination of photography and painting. And, I’m working on a large public sculpture, called “Levitating Tractor,” for the city of Sacramento and Phil Angelides in McKinley Village. It’s a complex but unique idea. It involves a 1940s tractor, which I purchased in the Delta from fifth generation Japanese farmers. The work is based on a layered idea. I’m going to take the “Body Environment” photographs and paint from them. Then the images of the paintings will be sent to Los Angeles to be heat embedded into aluminum through the dye sublimation process. These aluminum sheaths will then be attached to the tractor acting as the flesh of the tractor. It will be a beautiful, glistening, luminous material with aerial patterns of human culture layered over it. We’ll see how it turns out. But it will be exciting.